If I start with the beginning of my voting story in the early ‘90s, it is one of compassion and support, when two nice volunteers from either County Elections or my local party showed up to help me mark my ballot. By asking for accessibility assistance, I apparently wound up on some kind of “homebound” list that I didn’t belong on. Later, as an activist, I found myself wishing that every disabled voter got that kind of mobilization, but at the time, the “special treatment” embarrassed me. I let the resulting awkwardness cost me my vote in that cycle’s midterms. However, there are hundreds of thousands of disabled people of voting age in my state, so if we all faced barriers and gave up, that is a population at least as big as the margin that Hillary Clinton lost Midwestern states by that missed out on having our voices heard. Who knows what we could have affected if we had gotten behind some proposals and showed up even more than our non-disabled peers? I voted in person in the next Presidential election, but even getting the “I Voted!” sticker was not that satisfying when I factored in that I couldn’t get the machine to work and found the poll workers were not prepared for a wheelchair user to show up. Though I’d learned a lot over the years, a crosstown move and a resulting change in my personal care attendant situation meant that I wasn’t done being an electoral disappointment just yet. I neglected to change my registration in time to cast a vote that may have been considered moot by the Supreme Court anyway. Everything about that situation wasn’t my fault, but I didn’t do my part due to a strange combination of complacency and apathy, some sense that someone who “really mattered” would make a good enough choice that at least one thing could be off my shoulders. 2000 was an important year for me in that both my intentions (never pass up an opportunity to change things for the better) and the electoral moment (looking to increase ease and boost turnout) converged with Vote-by-Mail. There are many great benefits to widespread Vote-by-Mail. Because my state offers Vote-by-Mail, I never have to miss a vote again, even for small and extremely local issues such as school overrides. Also, I don’t have to wait in line, which saved me about two hours of my life during primary season 2016, given the mess Arizona made that cycle with widespread polling-site closures and technology glitches. At home, I can vote in private without thinking there is a harried voter behind me wanting to use the space. Unlike traditional absentee voting, I don’t have to give information about my diagnosis to “prove” that I need it or that I can’t get to a polling location, which is the best thing ever. While voting, I can wear a campaign shirt, eat (as long as the ballot stays away from the food—illegible ballots can be an issue) or, within reason, take an extra day to decide, which I might use as we have an embarrassment of riches in the Phoenix mayoral contest this time. If I have a question about a proposition, I can go look up the answer and my ballot will be right there waiting, which has saved me self-doubt and anxiety. 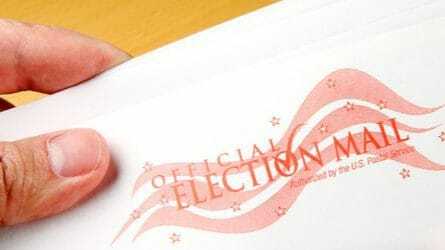 The mail feels familiar and safe, and paper ballots can’t be hacked. I would suggest that every state that hasn’t should expand Vote-by-Mail. For those worried that Vote-by-Mail might lead to the loss of Election Day traditions, may I suggest getting your vote in early, then helping a favorite candidate, either from your home or a campaign office? Campaigns always need the help, and someone should be happy to train you if you’ve got no experience. Access to participating in all stages of the election process and voting is a disability right. Erika Jahneke is a writer and activist based in Phoenix. She has been volunteering with the PAC Progressive Democrats of America since 2014, and she continues to strive to bring a disability perspective to progressive issues.